A century ago, you could buy a house out of a catalog. Catalog retailers like Sears and Montgomery Ward were big business in the early 1900s. Catalogs offered consumers everything. From well pumps, augers, and ice saws to stereoscopes, violins, and dentures. Almost anything you could imagine could be purchased and delivered to your door in four to six weeks. 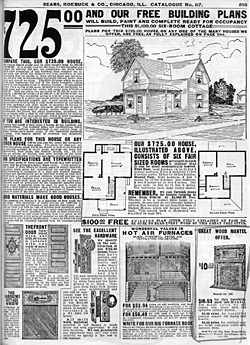 Page from the 1908 Sears Catalog offering house plans, doors, door knobs, fireplace mantels, and furnaces. It was a short stretch for Sears to go from selling building supplies and house plans to selling whole build-it-yourself houses. The company sold its first house kit in 1908 and continued selling them until 1940. Tens of thousands were sold. Whole neighborhoods and sometimes whole towns were built of Sears catalog houses. 164 Maynard Ave., a handsome Sears Modern Home No. 167, "The Maytown"
The Maytown from the 1912 Honor-Bilt Modern Homes catalog. At that time, The Maytown cost $645 ($14,000 in 2007 dollars) for the basic version or $2,038 ($43,700 in 2007 dollars) with all the amenities. To start, would-be builders looked through a special catalog, The Honor Bilt Modern Homes Catalog. If buyers needed more information they could visit the area office (72 S. Third St. in Columbus), speak to a representative, and look at scale models of popular houses, and mock-ups of rooms in those houses. Catalog homes were available in all the popular styles. Bungalows and Foursquares dominated the catalog in the 1910s, giving way somewhat to Colonial Revival and Cape Cod homes in the 1920s and 30s. 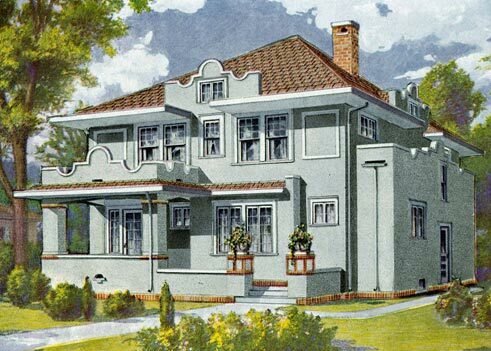 Catalog homes existed to satisfy a range of budgets from no-frills four room houses to substantial near mansions. Once the decision to but had been made, the buyer filled out an order form, indicating model, desired color, whether he wished the plans to be reversed or not, and any extras he wanted (Central heating, electrical lighting, plumbing, and garages were sold as extras.) and sent it off with a check, money order or letter of deposit. In the early years, Sears required the full amount plus shipping. Later on, in the 1920s, Sears began to offer financing for catalog houses. Buyers made a down payment, paid a finance charge, and then paid back the cost of the house over five years at 6% interest. Financing became a profitable part of Sears' business. After several weeks, a dedicated rail car would arrive in the buyer's town carrying the 30-40 tons of lumber and other building materials necessary to construct the house. Trucks or wagons would carry the materials from the depot to the building site. Catalog houses were like a model kit. There was a 75 page how-to instruction book that proceeded step-by-step from the foundations up. Sears labored to make the process foolproof. Each piece was numbered and labeled to indicate where in the building it went. Each step was described in detail and illustrated. Every piece was pre-cut to the correct dimensions to fit in its appointed spot. Once the foundation had been built, the builder needed little more than a hammer and a screwdriver to assemble the rest of it. 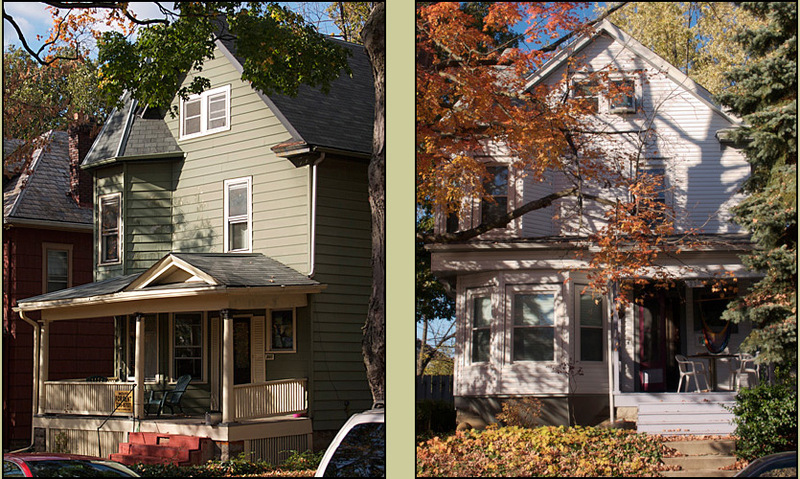 202 E. Northwood (left) and 236 Maynard Ave. (right), are two other Maytowns in the University District. 202 was built in 1913, 236 in 1912. Catalog houses offered significant savings to home-builders. Sears was able to use its massive buying power and economies of scale to produce lumber, paint, pipe, and hardware for less. Catalog houses were quicker to assemble than a conventional build and required less labor and less skilled labor. Catalog houses also wasted less building material than conventional construction projects. Sears advertised savings of 40% for catalog vs. conventional building. These savings were likely an attraction for 164 Maynard's builder. In 1912, Wilbur E. Benroy was a 25 year old attorney, fresh out of law school and working for the Columbus practice of Vorys, Sater, Seymour, and Pearce. Benroy and his wife Vera had just wed and were looking for their first home. The Benroys had two children at 164 and stayed there until 1920. Catalog houses were poplar from the early 1910s, through the 1920s and into the 1930s. In addition to Sears, Montgomery Ward offered "Wardway" homes. The Aladdin Lumber Company of Bay City, Michigan also did a brisk trade in catalog houses. It had actually pioneered the idea of the kit home back in 1906. 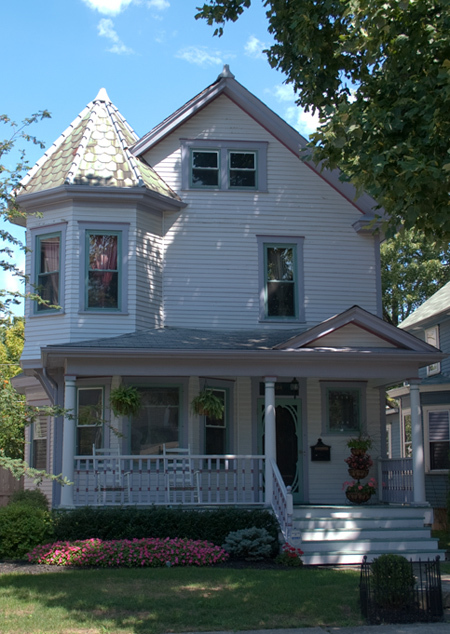 The Gordon Van Tine Co. of Davenport, Iowa was another player in the catalog house market. The business began to fall apart during the Great Depression when economic collapse brought home construction to a standstill. Firms that had offered credit to homebuilders saw hard times as debts went unpaid. Simultaneously, local building codes were becoming much more demanding. Codes varied significantly from one municipality to another, making it difficult to produce a product that was acceptable across the nation. Sears got out of the catalog house business in 1940 most of the rest followed not long after. In its nearly 40 years of selling house kits, Sears sold almost 100,000 units. Sears houses and those of its competitors are found in almost every city in America. Recognizing catalog houses can be difficult. Sears sold scores of models. Few of them had a distinctive feature like the Maytown's tower. Most were bungalows, Foursquares, and Colonial Revivals just like the local builders were building. Kit home designers and local builders freely borrowed from one another as they worked variations of a few basic designs. A house that may seem on the face to be a catalog home may, on closer inspection, just share a common inspiration or some common design elements. Case in point, 410 W. King Ave. For years, I had casually thought this house was a Sears Alhambra. A closer comparison revealed that it was not. It just shares a few decorative elements. 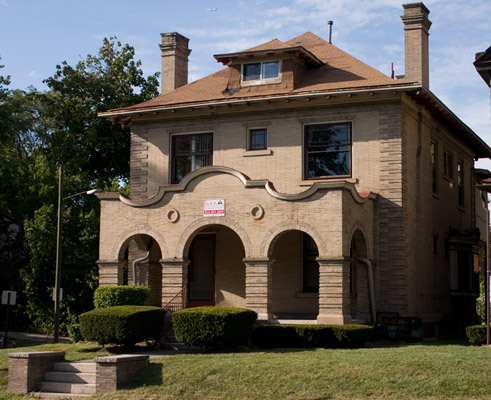 The Maynard Maytowns were first identified as Sears catalog houses by Kathy Mast Kane in Taking Stock: a partial survey of the university area's historic resources (1999). It's available in the Biography, History, and Travel section at Main Library downtown and makes an interesting read. For more on Sears catalog houses. 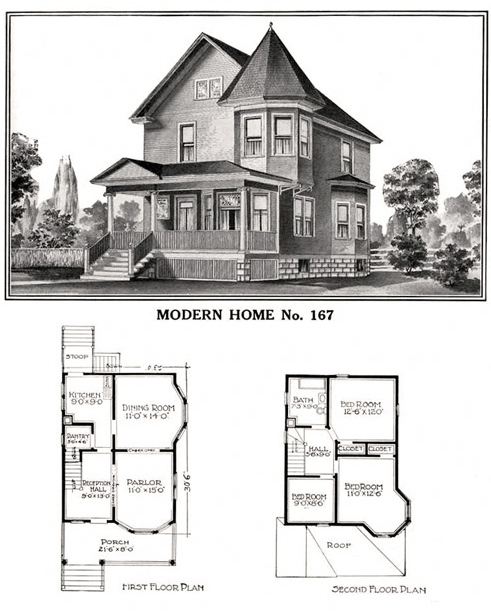 check out Sears Modern Homes and Sears Archives.